We have been having a great time here in Swaziland celebrating Christmas with the lowveld community. On December 12th, members of the Teen Club, along with their caregivers and guardians, came together to enjoy their annual Christmas party. For those who don’t know, Teen Club Swaziland is part of an international family of support groups, spearheaded by Baylor International Pediatric Aids Initiative. The clubs are made up of young members of the community who are living with HIV. Rising to the challenge of addressing the psychosocial and medical needs of HIV positive adolescents, the club meets once a month to offer support, to learn valuable lessons given by qualified medical professionals, and to nurture a sense of camaraderie amongst their members. It is also a great way to make sure the teens and their guardians are receiving all the help and guidance they need from Cabrini Ministries. To learn more about this exciting international program, visit BPAI’s website! We also want to send out a big thank you to RUCHI Wholesalers for donating mielie meal, beans, and sugar for the families to take home and enjoy. Thank you, RUCHI! Enjoy pictures from our fabulous Teen Club Christmas Party! What a treat! A few of the guardians perform a drama about the importance of being tested and adherence to medication. We were blown away by their talent! An angel appears! One of our talented Teen Club members performs the role of the angel for the nativity play. The girls perform traditional Swazi dances for an audience of their peers and caregivers. Simo Mamba does a great job as the Christmas Party MC! Thobile Matsubula, head facilitator of the Teen Club at Cabrini, opens the ceremonies with a word of thanks to the staff, the club members, and the guardians. More dancing by our fabulous Teen Club Stars! A word of prayer lead by one of the Teen Club guardians. Make way for the boys performing traditional Swazi dances! And of course, we must give the makes (mothers) and Go Gos (grandmothers) a chance to show off their dancing skills! Teen Club members and their guardians all together to celebrate Christmas! The United Nations just released the following video concerning Multi-Drug Resistant Tuberculosis in Swaziland (MDR-TB). In the rural Lubombo Lowveld where Cabrini works, this is a particularly troubling issue. While this video shows an entirely different area of the country than where Cabrini is based, the issues and responses are entirely the same. MRD-TB is extremely dangerous, easy to transmit and requires months of treatment. It can develop out of “regular” TB or can be passed on directly. Patients with MDR-TB have to take extreme precautions to avoid transmission and must dedicate themselves to extensive treatment. As pointed out in the video, this is difficult considering the limited resources in much of Swaziland. Local experts predict that in the coming years, MDR-TB will become the dominate strain of Tuberculosis in the country. This means more deaths, more expensive treatment, and higher risks for populations that have already been decimated by the HIV crisis. While most of the patients treated by Cabrini Ministries are HIV+ clients, a growing number receive services for TB. In 2011, there were 125 people who received TB treatment. As outlined in the video above, adherence is essential and that often means traveling deep into the bush to provide medication and other health care related services. This work is labor and cost intensive considering the rugged rural setting we operate in. Yet, because with HIV and TB, adherence is essential part of stopping the epidemic we are dedicated to reaching our clients regardless of their location or situation. This includes setting up remove refill locations as well as sending adherence specialists and outreach nurses out into the communities on a daily basis. If you would like to know more about work related to Tuberculosis or would like to donate to help support our work in this area, please contact us at info@cabriniministries.org or click on the DONATE button above. Note: Nathi Gumede, who is quoted in this video from the Red Cross, serves on the Board for Cabrini Ministries Swaziland. We are grateful for his service to our organization and the country as a whole. Yesterday, the International Treatment Preparedness Coalition released a report about prevention of vertical transmission, or prevention of transmission of the HIV virus from an HIV-positive mother to her child (available at www.itpcglobal.org). Transmission of the HIV virus from mother to baby can occur during pregnancy, labor, delivery, or breastfeeding. However, there is a triple-dose combination medicine available in places such as the US and Europe that prevents close to 100% of all transmissions if the mother takes it correctly. Most women in the developed world have access to the medicine and to health care services, so vertical transmission has been virtually eliminated there- one of AIDS’ few success stories. Yet in the developing world (such as Swaziland), the story is very different: only a third of women in the developing world are given any drug to prevent vertical transmission at all. The highly effective drug is only available to about 8% of these women; a different less expensive single-dose medicine is given that is only about 40% effective. Stephen Lewis (former UN Special Envoy for HIV/AIDS in Africa) and Paula Donovan, co-directors of AIDS-Free World (www.aids-freeworld.org) and writers of the preface to the report, call this “a shameful example of double standards.” And, these numbers are far from the ‘universal access’ goals that UNAIDS, the G8 countries, and other agencies were trying to achieve by 2010. The report presented on-the-ground research from six countries about the barriers women face in accessing these health services, and criticized global and national programs for failing to ensure newborns and their mothers receive appropriate treatment and care. It illustrated that the emphasis is put on keeping babies alive and not following up with women, who must be put at the center on this issue. In our experience, we agree, the response on this issue has been a failure, and the barriers that were identified in the countries in this report ring very true in this community. There are programs available that would work to prevent HIV in the child if the mother went to the clinic regularly and followed the instructions for treatment. It is not necessarily so simple for women to do that, and we agree it is critical to identify and respond to the sociological reasons why. Many people say the prevention of vertical transmission program here has been a success, but their measure of success is if a pregnant HIV+ woman is given the prophylactic medicine when her child is born. This may mean the mother went without treatment for her own HIV, the baby and mother went without prenatal or follow-up care, no care was provided for the rest of the family, and no information about HIV prevention or reproductive health was provided to this woman. Also, this woman may have been handed the prophylactic medicine to take during delivery, but no one knows if she even took it or not (and in many cases she does not) because there is no follow-up with the mother. 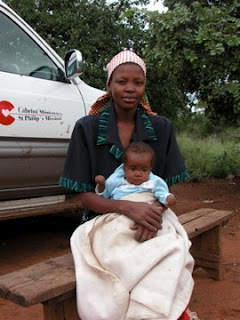 And women are delivering their babies on the homestead (meaning often in a mud hut, with no running water, electricity, supplies or health care workers), because they can’t afford the hospital transport fees. Sometimes, mothers and their babies suffer and die this way, and it is tragic, for many reasons but one because it is preventable. If a woman manages to obtain the medicine, she may not take it because she may be trying to hide her HIV+ status from a mother-in-law or husband (often authorities on the homestead) who can decide to throw her out of their home if they find out. Also violence against women is pervasive and constant, and as the report shows, is a real barrier to HIV+ women accessing health services. We have realized that a community-based comprehensive care approach, which truly takes in consideration the socio-cultural reality of the person you are serving, is necessary for any health program to work, especially prevention of vertical transmission as a part of women’s health. Women need special attention paid to them and their socio-cultural situation, which in Swaziland, can mean a deep gender inequality that does affect their access to health. Also follow-up is key here- with a pregnant HIV+ woman, a multi-drug resistant TB patient, or anyone that needs health care. You can’t tell people one time in a clinic- here, this is what you have to do for a year and a half- and expect compliance with that. You must have a relationship with people that is sustained over time. We are doing what in social work we call ‘case management.’ We work with St. Philip’s Clinic here to identify mothers in need of prenatal care. Then we start providing home health care, going to their homesteads and working with their whole family. 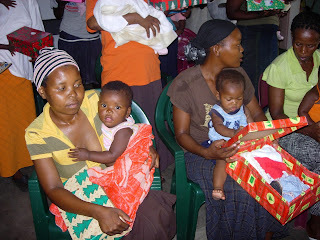 We do extensive education, and we closely follow the mother and child until the child is 18 months old, continually reinforcing the prevention and care steps the mother and family must take (prenatal care, basic HIV understanding and testing and counseling, arranging supervised delivery, follow-up care with the baby and mother including on infant feeding practices). 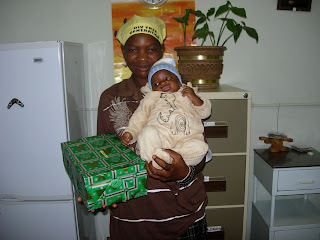 We provide transport to the hospital and clinics, and supplemental nutrition for mothers and babies. You must sustain a relationship based on what people need. And if that relationship is broken in any way, you have to have the will and dedication to go out to the people and figure out what they need. HIV+ pregnant women and their babies need this kind of personal attention, ongoing support and true “care”- health care that is more compassionate to their often silenced and neglected needs. 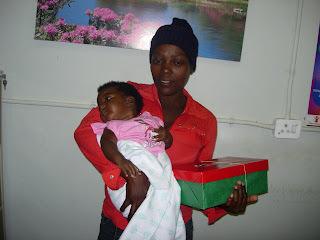 Thanks to FLAS (The Family Life Association of Swaziland) for the gifts of infant clothes which some of these photos show some of our mother and child patients receiving. One of the two main works we do at Cabrini Ministries is Health Care Outreach (the other is Care of Orphans and Vulnerable Children). We provide health care services to about 1000 patients a month. Our health care program has received accolades for delivering high-level professional and comprehensive health care services to the St. Philip’s Mission community in Swaziland. Especially when dealing with illnesses like HIV/AIDS and TB, we believe highly organized comprehensive care with a lot of follow-up and monitoring is the only way to make progress. We provide blood testing services and counseling for approximately 100 adults and children in our community per month. This includes a test to find out if someone has the HIV virus, following up with results, and providing counsel based on the results of the test. We also monitor the CD4 (or T-cell/ immune cell) counts for HIV+ people via blood tests. The CD4 count of an HIV+ person is what determines whether they need medication (antiretroviral drugs or ARVs) or if their immunity is strong enough that they do not need medication. There are about 450 HIV+ people that we administer ARV medication to every month. The drugs are provided by The Global Fund to Fight AIDS, TB and Malaria. We keep detailed records for each patient in our health care program- this is very important in administering complicated treatment regimens like those for HIV and TB. About 10 new HIV+ patients per month have to go on ARV medication in our community. One of our programs, in collaboration with St. Philip’s Clinic, is called the Strong Mother/Strong Baby Program. There is a very high infant and birth mother mortality rate here and this program aims to provide pre- and post-natal education and health care for mothers from a nurse/midwife team. 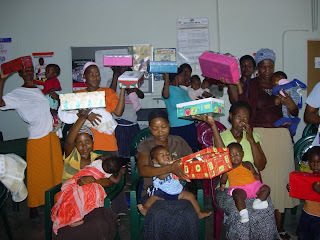 There are about 100 mothers & infants in the program. HIV+ mothers can give birth to and raise HIV- babies, but steps must be taken, such as taking PMTCT medication during pregnancy, and avoiding breast-feeding. We provide testing, referrals, transportation to the hospital for medication, formula, education classes, bottles, soap, candles and matches for sterilization, and other services as needed. Tuberculosis is the leading cause of death in Swaziland, because the HIV infection rate is so high. TB attacks people with compromised immune systems. We have begun to screen every HIV+ patient for TB with a sputum test. We administer medication to about 50 adults and children per month for TB. We provide walk-in community health education sessions twice a week for about 30 people each session. At these sessions- usually led by a Swazi nurse or Swazi HIV+ health care staff member- we review basic disease and health care education for HIV/AIDS and TB. We also provide HIV education at our monthly staff meetings. Support groups have formed naturally among HIV/AIDS and TB patients in the community education sessions. We provide about 800 dietary supplement packages per month to our health care patients. Malnourishment is a serious health problem here because of drought and the lack of economic opportunities. (Click to read more about the drought, climate change, and the food crisis in Swaziland: “Life in a Changing Climate” or “Food Crisis in Swaziland”.) We believe nutritional support is critical to comprehensive health care, especially because people cannot take medications or stay healthy and off of medications for HIV/AIDS and TB if they don’t have enough food. The nutritional packages contain such items as fruits and vegetables from our farm, Morvite (a vitamin powder mixed into a drink), and a corn/soy blend. At our drop-in center at St. Philip’s Mission, staffed by nurses and assistants, we receive about 350 patients per month, for everything from HIV/AIDS and TB testing, treatment, care, and follow-up; to other, often secondary infections, such as skin infections, diarrhea and vomiting; and education and emotional and spiritual support. For those too sick to come to us, we deliver the same services to them at their homesteads. We work very closely with the traditional system of the Rural Health Motivators (RHMs)- community members who are trained to diagnose people on homesteads and help get them to us for more care. Swaziland has a great shortage of trained doctors and nurses for all the people that need health care, so the RHM programme is a stopgap in place right now. We visit about 50 people on their homesteads with our mobile clinic and home-based care program. To read about a typical home-based care visit, click on the post: A Visit to A Homestead. One reason why many people can’t access treatment for HIV or TB is the lack of transport to and from hospitals and clinics, which can be miles and miles away. We transport over 350 people a month to hospitals and clinics for the services they need there in Cabrini Ministries vehicles. We suffer about 5 deaths per month, usually all from HIV/AIDS. This is a loss this community feels so deeply. But for 1000+ people a month, the health care program means receiving health care services they need, and sometimes means literally receiving life. The health care program is a ray of hope and healing that we feel and appreciate here. Also, the people that we provide health care services to in the communities around us are also often intimately connected with the orphaned and vulnerable children at our hostel- such as being the immediate and extended family members and very close neighbors of the children. With both our health care and orphan care programs (and education and agriculture), we aim for a continuum of community health in all aspects of the word.